In roulette casino game, the odds of winning on a bet in the same on every spin are very low. However, very frequently players try to turn these odds into their favor by doing something which they think would be lucky for them. 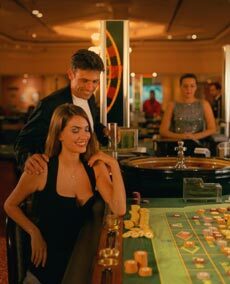 As in all other types of casino games, roulette is no exception when it comes to superstitions though, anyway, some roulette strategyexists of course. Casinos are filled with gambling superstitions, myths and advice which is handed down from players to players on what they think is lucky and unlucky in a game. There could or could not be any logical explanation for these beliefs, but the fact is, that players do believe in them with all their hearts. In roulette casino game there are several superstitions which are attached to numbers and colors since the game is mainly based on the color to be picked and the amount of bet to be placed on that particular number and color. One of the most commonly seen superstitions in roulette is to bet on sleeping numbers. A sleeping number is one which has not been hit for a long time. There is no logical or mathematical explanation for doing this. The chances for a sleeping number to win would be the same as any other number; however, many players do believe, that if they bet on a sleeping number it will be lucky for them. Other players believe, that on the roulette table you should always bet on the first color which catches your attention. The color should then be attributed to the bet and if a bet is placed, then there are very high chances of winning. Several other players believe, that they should always bet on their lucky number for every single spin since it is guaranteed to win them money. For many players, if they have won a particular round at roulette before, the number on which had placed a bet becomes their lucky number. Like in all other types of games, there are several lucky items which players carry with them when they go to play roulette. These lucky items could be a horseshoe, rabbit's foot, four leaf clover, a particular item of clothing, crossed finger, a particular color etc. Similarly there are also several things which players consider to be unlucky for them. These unlucky things could be the color black, having a dog close to the table, a black cat crossing the path, breaking a mirror or walking under the ladder. If any of these events occur during the day, the player would try to avoid playing roulette. The other superstitions include saying a prayer before starting the game, carrying a rosary or any other religious item before beginning the play or even an elaborate religious ritual which needs to be carried out before the game begins. These were a few superstitions related to roulette (some roulette myths are also possible to meet among gamblers). The fact is that when a person wins a little on the table and he attributes it to his/her luck, he would then start playing more seriously and with better concentration which automatically increases his chances at winning.